In the wake of the devastating destruction to Haiti caused by Hurricane Matthew, President Bill Clinton took to Twitter and urged his six million-plus followers to go to the embattled Clinton Foundation to assist in relief efforts. 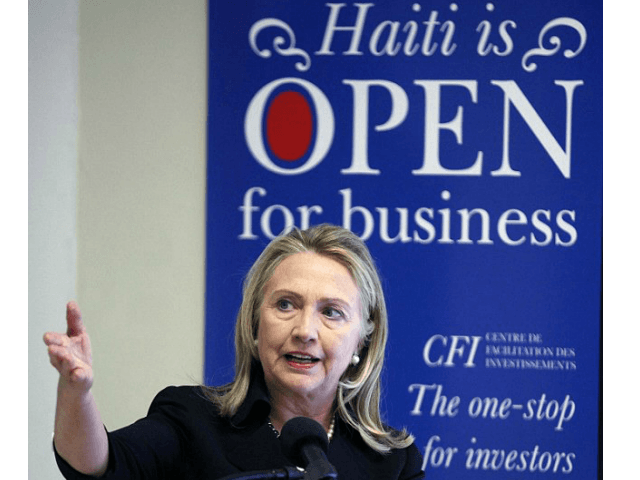 The last time tragedy struct the tiny Caribbean country, Bill and then-Secretary of State Hillary Clinton — according to scores of enraged Haitians — used their billion dollar charity and leveraged their global connections to enrich themselves and their monied cronies. Following the devastating earthquake in Haiti in 2010 — while 316,000 lifeless bodies lay buried under rubble, and while 300,000 Haitians suffered from injuries, with another 1.3 million displaced — the Clintons saw an opportunity to cash in. Hillary Clinton’s brother, Tony Rodham, landed a lucrative and historically rare Haitian “gold exploitation permit,” while Clinton Foundation donors, including Digicel mobile phone company founder Denis O’Brien, were winning multi-million dollar contracts that would siphon massive profits from the poorest country in the Western Hemisphere. While then-Secretary of State Hillary Clinton’s State Department was funneling billions in relief funds to rebuild Haiti, the Clinton Foundation was leveraging its influence to guide high-dollar contracts to longtime Clinton cronies who would go on to reap millions off the catastrophe that had claimed so many lives on the devastated island.